PYEONGCHANG, South Korea (AP) — Silver is sweeter this time for U.S. bobsledder Elana Meyers Taylor. Her perspective has changed so much, and in so many ways, over the last four years. The silver medal she got at the Sochi Games in 2014 represented failure. It was nothing more than a shiny reminder of a loss, a bauble that she wanted to put away almost from the very second it was slipped around her neck. And now, another silver — except one that she'll savor. 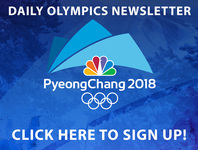 Meyers Taylor, with brakeman Lauren Gibbs, was second in the women's bobsled event that concluded Wednesday night at the Pyeongchang Olympics. She lost by 0.07 seconds over four runs at the Alpensia Sliding Center to surprise winner Mariama Jamanka of Germany and didn't stop smiling for what seemed like hours afterward. "I am going to enjoy this. We're going to go on vacation and we're going to enjoy this," Meyers Taylor said as husband Nic Taylor — accidentally, he said — sprayed her with a bottle of shaken-up sparkling water. "Part of it is just about the journey, and this has been one heck of a journey. I thought it would be easier after Sochi. I thought it would be a breeze after that. And things have only gotten more difficult. The things I've had to overcome have been crazy." "At that point, I didn't want to think about bobsled," Meyers Taylor said. "I didn't want to be in a sled. And I love driving a bobsled more than anything in the world — except Nic of course. But to be at such a low point earlier this year and not be sure that I wanted to slide anymore and not have any joy in it ... to come back and win a silver medal, I am through the roof." Holcomb's death was a constant challenge for the team this season. He was essentially a driving coach for Meyers Taylor, someone to talk to about lines and strategy and equipment and just about anything else related to the sport. With him gone, Meyers Taylor spent countless nights grieving with teammates and coaches. Fittingly, she's now linked to Holcomb again. It's her third medal in all, which means that no one in the history of USA Bobsled has placed more often at the Olympics than Meyers Taylor. Pat Martin won three, a gold in 1948 and two silvers in 1952. Holcomb also has three, a gold in 2010 and two silvers in 2014. Meyers Taylor won bronze as a push athlete in 2010, silver as a pilot in 2014 and now silver again. "His legacy lives on," Meyers Taylor said. "It's the least I could do."